Join us for some summertime fun & fitness! An inspiring week for all aspiring acro dancers and gymnasts! In our intensive athletes focus on ballet, jazz, and acro technique while also working on new tumbling skills, strength, and flexibility! 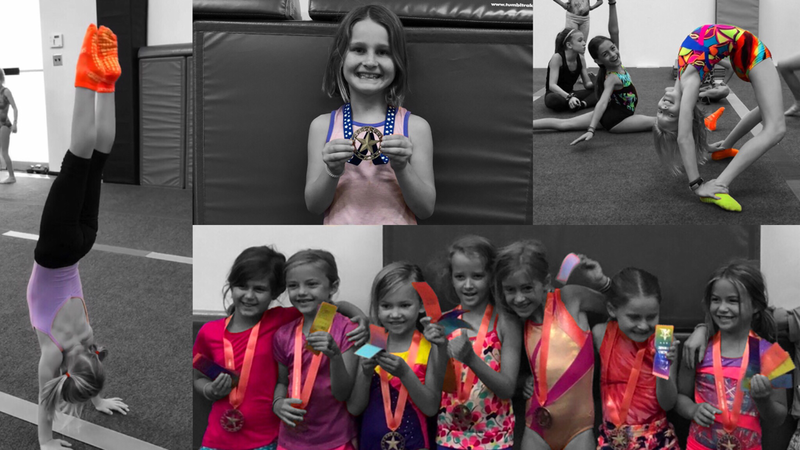 Our Acro & Tumbling camp is perfect for dancers, gymnasts, and cheerleaders! This camp focuses on strength, flexibility, acro technique, and tumbling skills. We offer safe, technically sound, and fun instruction! Camp runs 9:00am-12:00pm Monday through Friday for beginner through advanced athletes ages 6-10. ​Each participant receives a medal on the last day of camp. A fun introduction to acro for beginners focusing on building a solid foundation on which to excel. For athletes who have a solid grasp of the basics and are ready to take their acro skills to the next level. Ready for those crazy acro tricks you've seen online? If you have a solid foundation of basic and intermediate skills, this class is for you! ​​Our specialized ballet & jazz class is designed to enhance the skills of dancers and gymnasts. Come flip. Get fit. Have fun. Please let us know your child's name and age, and if they have any dance, cheer, or gymnastics experience. Participation in Advanced classes requires an evaluation. We will confirm your spot and email a link to download the registration form. Thank you!